Aaron Lansky is the founder and president of the Yiddish Book Center (www.yiddishbookcenter.org) in Amherst, Massachusetts. The recipient of a MacArthur “genius” fellowship, he has helped fuel the renaissance of Jewish literature in this country. He lives with his family in western Massachusetts. "A marvelous yarn, loaded with near-calamitous adventures and characters as memorable as Singer creations." Why did so many older Jews consider their Yiddish books their yerushe or "inheritance"? How is this concept of inheritance different from or similar to your own? Discuss some of the ways the next generation considered themselves to be "unlike" their immigrant grandparents. Is it unusual to find chil­dren more interested in the generation of their grandparents than that of their parents? Lansky describes the National Yiddish Book Center as a "home" for Yiddish books. Why did these books need a "home"? What motivated Lansky's choice of Amherst, Massachusetts for the National Yiddish Book Center? What does Lansky mean when he describes the Canadian immigration experience as a "mosaic" rather than a melting pot? How did American Jewish culture and Canadian Jewish culture develop differently? 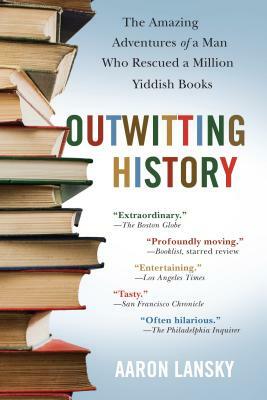 In the end, do you think Yiddish "outwits" history? Why or why not?